Modding the Xbox 360 firmware has been around for quite some time now which enables you to download images of games from different sources, burn them onto a DVD and run them on your console. Of course this is useful if you want to backup your discs but this is something Microsoft doesn’t want you to do for obvious reasons. The all new Xbox 360 Slim (or S) which was released in June 2010 at E3 had a new protection installed on the drive which made all the previous mods useless. 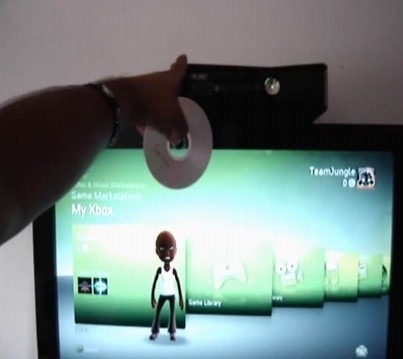 But if this video is to be believed, hackers have managed to hack Xbox 360 S / Slim to run writable discs. Video after the break. The team which has pulled off this feat call themselves Team Xecuter and with a little collaboration from Team Jungle and commodore4eva. They claim to have hacked the DVD drive of the new Xbox 360 to play writable discs as seen in the video below. According to the team, it will be released soon. Actually, creating backup discs has always been legal, it’s just the DMCA that caused a contradiction in the law that hasn’t really been resolved. It’s amazing how we don’t see the underside of the disc to confirm it’s a copy. Stocking a lable on a disc Is very easy. lolz… dont knw why ppl are doubting these guys … But i myself am surprise to see xbox s being hacked, though we would see ramifications in the days to come, may be M$ would disable kinect for all the fw hacked consoles ! Its not a Xbox 360 DISC with a label on it. If you look at the inner edge of the DVD its clear straight through, as with the Xbox 360 Game Disc it has the Xbox 360 hologram logo on it and is not see through. So research first before you run your mouth.